Unisig's UNE 12-2 compact gundrilling system brings new levels of increased manufacturing capacity to a variety of industries, including automotive, medical and firearms. Whereas a shop may perform deep hole drilling on Swiss automatic machine tools, a dedicated deep hole drilling solution, such as the highly-engineered UNE 12-2, significantly reduces lead times and provides a higher degree of accuracy and precision. Due to its compact design, the UNE 12-2 is easy to install in a shop's existing CNC machining cells. The UNE 12-2's advanced process monitoring and control system displays real-time machining data. 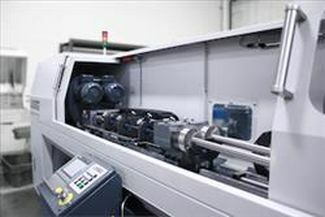 The system tracks measurements such as advanced thrust power and coolant pressure and reports them back to the operator, which allows for optimization of the machine's operating conditions. The fully programmable coolant system creates ideal temperatures on the cutting surface to eliminate thermal damage to workpieces. The UNE 12-2 has many uses in different industries -- from fuel rail components for diesel engines and transmission shafts for the automotive industry to blanks for surgical tools in the medical industry. For firearm production, the UNE 12-2 can create barrel sizes from .17 caliber to .50 caliber. With an optional barrel reamer, the machine performs two steps of the barrel blank production process. As with all UNE series systems, the UNE 12-2 is a high-performance drilling machine that increases a shop's productivity and lowers production costs by allowing it to bring more jobs in-house. UNISIG's deep hole drilling technologies are all engineered and manufactured in the United States with high-performance components.